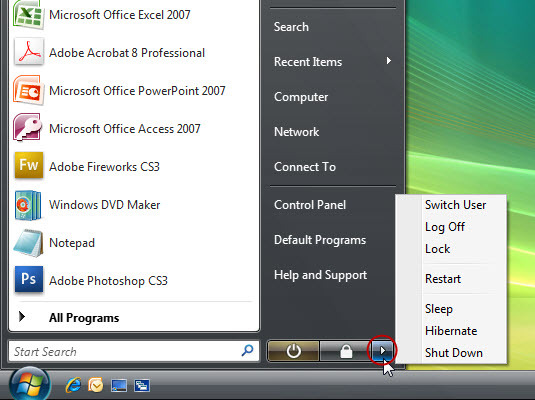 You can find several options for shutting down your PC from the Start menu. Keep the computer on all the time: This option is viable. Really, it is. Log off: Tell Windows that you’re done without having to turn the computer off and then on again. Lock the computer: Use this quick way to suspend computer operations and present the login screen, but without actually logging off. Switch the user: Allow another user on the same computer to access their account without logging off from your own account. Sleep mode: The computer slips into a special, power-saving Sleep mode, like going into a low-power coma. Restart: You turn the computer off and on again in one step, mainly when installing or upgrading software, or sometimes to fix minor quirks — like slapping Windows upside its head. Shut down: Just turn the darn thing off. Yank the power cord out of the wall: This method is satisfying, but not recommended.